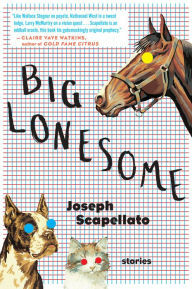 Joseph Scapellato is the author of the new story collection Big Lonesome. 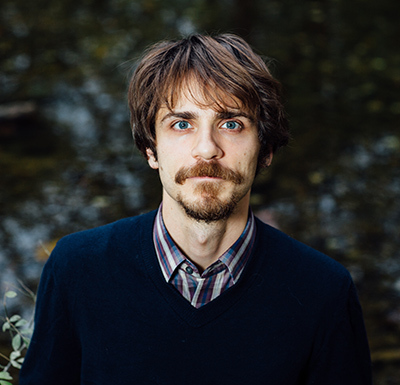 His work has appeared in a variety of publications, including the Kenyon Review Online and Post Road. He teaches at Bucknell University, and he is based in Lewisburg, Pennsylvania. Q: Why did you opt to focus many of the stories in Big Lonesome on cowboys, and what do you see as the role of cowboys in the American West, both historical and mythological? A: In 2005, I moved to Las Cruces, New Mexico, to earn an MFA in Fiction at New Mexico State University. As a Midwesterner, I was wowed by the high desert’s dramatic landscapes—I couldn’t spend enough time outside, whether it was hiking, standing around, or straight-up staring. After I finished my MFA in 2008, I moved to Central Pennsylvania with my now-wife. As I returned to writing, I found that every story I was working on wanted to be set in the southwest. I began to feel a preservative urgency, a need to get something of the experiences I’d had in the southwest into my work. I wanted to hang onto what I’d felt when there, the big feelings you get in a big landscape. But pretty soon the stories started to be about the myths of the American West, American masculinity, and American identity. The figure of the cowboy had become a vessel for mythology. And I think that’s what the cowboy is to most Americans today. Historically speaking—and I’m no expert!—the cowboy was a poor man who took care of rich men’s cows. That’s it. But if I’m not mistaken, the forces behind the American beef industry were in bed with the forces behind the transformation of the American West—the forces that gave white settlers permission to endorse, enable, and execute systematic genocide in the name of taking land from Native Americans. In this way, then, the cowboy was an agent of Anglo-American culture. Mythologically speaking, the cowboy is inexhaustible. He/she has been cast and recast countless times in tall tales, songs, art, photography, poetry, fiction, film, and TV. What we imagine when we imagine a cowboy might say something about what we imagine when we imagine America’s past. For a gritty, funny, and moving take on the figure of the cowboy, check out Larry Watson’s novel As Good As Gone, which just came out last year. It’s terrific. Q: You divide the stories in the book into three categories: Old West, New West, and Post-West. How did you decide on these categories? A: One of my goals was for Big Lonesome to be a “concept album” story collection—I wanted the stories to feel in conversation with one another, for there to be thematic resonation and thematic dissonance. In the end, I tried to make it so that the collection goes on a journey: the stories begin in a mythic West (a centaur cowboy, a cowboy who encounters a filthy monster-boy in a laundromat, a cowboy who can sing animals into easy dying), move to a contemporary West (a mother who buries her son’s gun in a desert, a hike that results in a snakebite), and migrate to the contemporary Midwest (two troubled brothers in Chicago, an old man forced into a retirement home by his son). Along the way, the stories shift from the non-realistic to the realistic and from the rural to the urban. And certain ideas (American mythology, masculinity, lonesomeness) are returned to and riffed on in different ways. My hope is that the section titles—Old West, New West, Post-West—lend another layer of meaning to this progression, as a whole, as well as to the stories themselves, on their own. Q: How did you choose the book's title and what does it signify for you? A: At first, I thought about calling the collection “The Bossy Bigness.” It’s the name of a character from “Mutt-Face,” a kind of personified feeling. This title guided me for some time—it steered me toward making the mystery of feeling central to the book—but I didn’t tell anyone about it until I went out for a cup of coffee with James Tadd Adcox and Matt Rowan, two writers I admire. We were at New Wave in Chicago, talking about our current projects. I told them my working title: The Bossy Bigness. “It’s not a good title,” they said. “It’s actually a really terrible title,” they said. As soon as I got home, I made a list of words associated with the collection. It was a big list. I mixed and matched. When I put “Big” and “Lonesome” together, I liked the way they looked—it sounded like the title of a song. Or what you might name a guitar, or a mesa, or a road, or a bar. It was somehow simultaneously specific and vague. Like my favorite myths. Q: Some of the blurbs compare your work to that of Larry McMurtry. What do you think of that comparison? A: I’m honored! I’m embarrassed to admit that of McMurtry’s enormous body of work, I’ve only read All My Friends Are Going to Be Strangers. But I loved it. I recently went back to that novel. It’s so exuberant, funny, and emotionally powerful. A: I’m working on a novel called The Made-Up Man. It’s about a man who knowingly puts himself at the center of a menacing performance art project, one that mines his personal life for material in increasingly sinister ways. The man makes this decision partly because he’s being manipulated by the lead artist (his uncle), partly because of a woman who’s just rejected his marriage proposal, and partly because he’s having trouble seeing that he’s being ground down by an identity crisis. It takes place in Chicago and Prague. I’m shooting for The Made-Up Man to be a kind of inverted literary film noir. It’ll come out in Spring 2017 (FSG). A: As soon as I finished the final draft of Big Lonesome, I found that I had a sudden craving for story collections. I couldn’t read enough of them. At various family functions over the holidays, I was reminded that many (most?) Americans haven’t read a story collection a.) since high school or b.) ever. Therefore, I’d like to mention a few story collections that I’ve read (or reread) recently, that I can’t stop thinking about, that family and friends and strangers should check out: Intimations by Alexandra Kleeman, Happiness, Like Water by Chinelo Okparanta, Third Class Superhero by Charles Yu, The Miniature Wife by Manual Gonzales, Man V. Nature by Diane Cook, The Unfinished World by Amber Sparks, The Era of Not Quite by Douglas Watson, A Tree or a Person or a Wall by Matt Bell, The Corpse Expedition by Hassan Blasim, The Map of the System of Human Knowledge by James Tadd Adcox, and Children of Monsters by Melissa Goodrich.